A tour for those who want to fully experience the Pantanal. A route focusing on mostly frequented by the jaguar, where it is easier to catch sight of it. Accommodations are comfortable and functional. 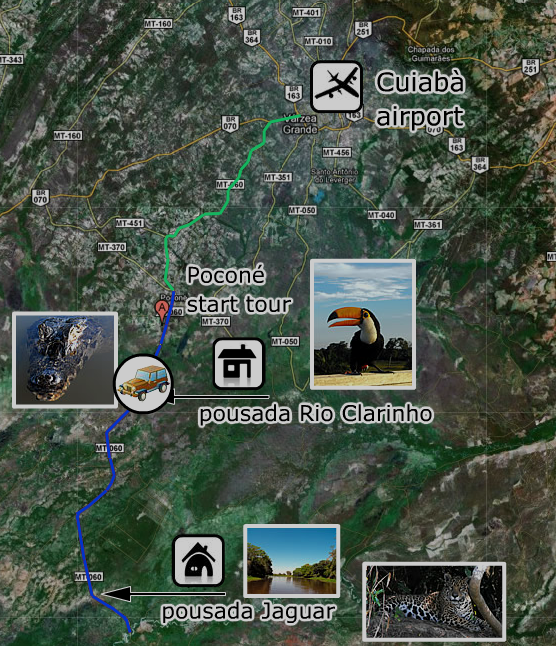 Stages: Cuiabà Airport; Start of Tour in Poconé; Accommodations Pousada Rio Clarinho, Pousada Porto Jofre Pantanal Hotel. Departure for Poconé (The capital of Pantanal); a short tour of Poconé, lunch in churrascaria (not included) and departure for the Pousada “Rio Clarihno”. In the evening, after dinner in Pousada, there is a short night safari, during which you may bump into various animals and nocturnal birds, including crab-eating foxes, tapirs, white-lipped peccaries, raccoons and ocelots. Departure in the morning for a walk inside the pousada (the entire pousada has an extension of about 13000 hectares) where you could appreciate the characteristic caymans of the Pantanal (Jacarè), the Jabirù (or Tuiuiu, the symbolic animal of the Pantanal), the capybaras (the largest rodent in the world) and innumerable bird species. Departure for Porto Jofre, where Traspantaneira ends, with some stops on the way to appreciate the various species of aras: the hyacinth macaw (an endemic bird of the Pantanal), the blue-and-yellow macaw (with yellow and blue plumage), nesting places of Tuiuiu, toucans, families of Capybaras, and with some luck the great anaconda and the infamous jaguar (Onca pintada). You will have lunch, dinner and spend the night in the Porto Jofre Pantanal Hotel. In the afternoon there are an ecological walk and a night safari in the evening, during which you have got much greater opportunities to see a jaguar, a tapir or an ocelot. In the morning there is a photographic safari as far as the waters of Rio Cuiabà. When arrived on the riverside, we will go for a motorboat tour, by which we have got much greater opportunities to bump into a jaguar. Packed lunch near the river, then back to Pousada for dinner and overnight stay. In the morning back to pousada “Rio Clarinho”. Lunch in Pousada and in the afternoon we will visit a lookout tower, where you could enjoy a breathtaking surrounding view characterized by sunsets which seem to be painted by an impressionist artist. In the morning there is a ride on tame horses from Pantanal inside the Pousada. Lunch and, in the afternoon, visit of a gold mining site and some artisan stores in Poconè for the purchase of typical products and souvenirs; Then return to Cuiabà airport in due time.